The model PGS21 switchGAUGE is a combination of a Bourdon tube pressure gauge and a pressure switch. It offers the usual analogue display, which can be read on-site irrespective of the power supply, and in addition the possibility to switch a potential-free electrical signal. One or two fixed switch points are factory-set to customer requirements, between 10 and 90 % of the scale range, and indicated on the dial by red mark pointers. Depending on the pressure gauge's pointer position, the circuit will be opened or closed. Thus the switchGAUGE can be used actively for process monitoring, for example to control the level of a gas cylinder or a hydraulic circuit. 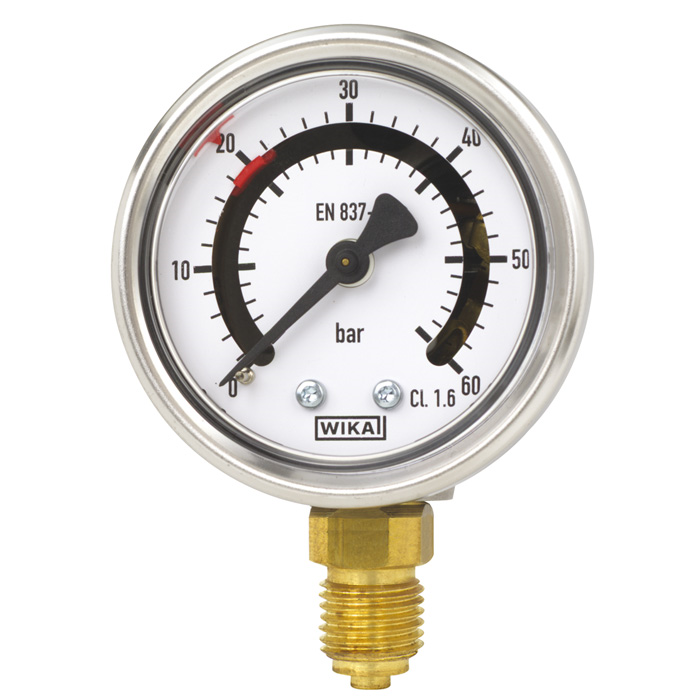 The switchGAUGE is available as standard in scale ranges from 0 ... 2.5 to 0 ... 400 bar with an accuracy class of 2.5 and a 1 m round cable for the electical connection. Through various options (e.g. other scale ranges, higher accuracy class, other cable lengths, plug connection) the pressure measuring instrument can be matched exactly to the the customer-specific requirements of each application. The instrument has been designed in accordance with EN 837-1 and fulfils all the requirements within it. Furthermore it features increased ingress protection of IP 65 and can therefore be offered with optional liquid filling to increase its vibration resistance.